In 2010 at the request of the Springfield Museums, the Conway School of Design prepared a plan for “ An Open Air Museum for the Springfield Museums”, and since then they have been attempting to incorporate plants native to North America into their landscape, which, until 2012, consisted mostly of overgrown pachysandra, euonymus, and ivy. 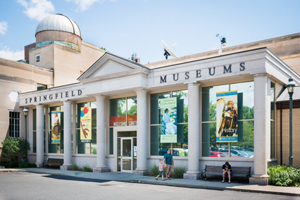 When I was asked to plant a mix of perennials and annuals in front of the Connecticut Valley History Museum to add color to a recently planted landscape of native shrubs, I discussed the possibilities with Dave Stier, Director of the Springfield Science Museum. We decided to expand the native plants garden in front of the History Museum to include the 37' x 14' area to the side of the building. I put out a call to the Master Gardeners of the Lower Valley. Lisa Bennett, Wenda Restall, Nora Santourian and Kathy Lovell expressed an interest in working on the project, while several other Master Gardeners offered to donate plants from their gardens. 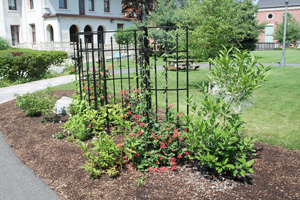 In August 2012, the Museum gave us $450 to start the project and purchase a trellis and some native vines, and in October, we applied for a matching grant from WMMGA to finish buying and labeling the plants in our design. In the spring, on Monday mornings between 9 a.m. and noon, with the help of a new class of interns, MGs Nancy Williams, Ellen Patashnick and I have finished the planting of that garden and moved on to the new challenge of eliminating the invasive Yellow Flag, Iris pseudacorus from the Yertle the Turtle Garden. It took six people three mornings to clear all of the iris from one side of the pond and we celebrated on the fourth Monday by planting eight knock out roses and four flats of annuals donated by Ellen and Nancy. 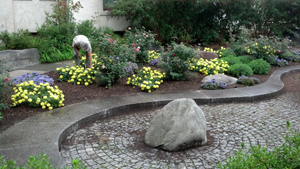 Over the next several weeks, we planted a butterfly conservancy garden in front of the Science Museum and cleared an area of pachysandra in front of the Fine Arts Museum, replacing it with native ferns and wild flowers. Please visit the Springfield Museums and enjoy the work we’ve done and feel free to join us on Mondays during the gardening season.